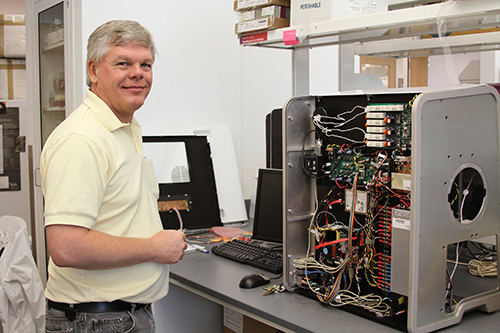 ANBM's Instrumentation team has more than 35 years of experience in electronic design and custom software. We have developed single specialized circuit boards and large instruments complete with software that meets the requirements of the users and have worked toward miniaturizing larger systems available commercially, while improving system capabilities. Our team can design and build circuits from concept to operation and are capable of doing rapid prototyping in-house for small circuitry. We have a firmware designer for microcontroller circuitry, as well as a LabVIEW specialist on site to create custom software for both custom and commercial instruments. This expertise allow us to design, build and control prototype systems to your specifications.